Kirana Colleges offers a range of Child Care Courses in Early Childhood Education and Care. The Certificate III in Early Childhood Education and Care will teach you how to care for children, nurture their development and make sure their environment is safe and supportive and is ideal for individuals wanting to work in childcare or wanting to be qualified. 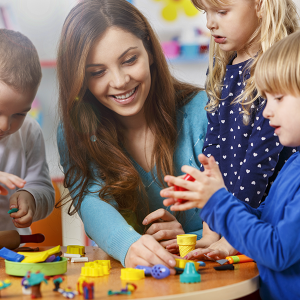 With a Diploma of Early Childhood Education and Care, you will learn to plan, implement and manage programs in early childhood services, in accordance with licensing, accreditation and duty of care requirements. The children’s services sector is one of the most fulfilling career paths you can take, where you’re not only going to be sought after by employers, but changing the lives of children you care for. With new legislation changes and high demand for child care workers, now is the perfect time to do a child care course with Kirana Colleges and start a career with endless opportunities. Get started on the career of your dreams with a Certificate 3 in Early Childhood Education and Care. NSW law requires that to work in this industry, you must have, or be actively working towards, at least an approved certificate 3 level education and care qualification. This Certificate 3 in Early Childhood Education and Care will teach you how to care for children, nurture their development and make sure their environment is safe and supportive. DurationThis course can be completed in 4 months.